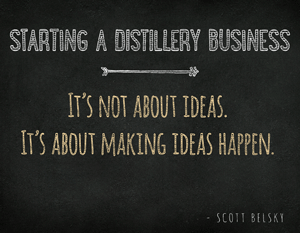 There are many issues to consider when starting a distillery business in Illinois. The first step is to address the business organization. For example, will the distillery business be organized as a sole proprietorship, a partnership, a limited liability corporation, or a corporation? Choosing the type of business entity is essential in the formation of a business and involves considering tax related and non-tax related issues. Our Chicago corporate lawyers provide guidance to our distillery clients through the entire process of business formation and offer counsel as to what business entity best suits a particular client’s needs. Distilleries also need to be aware of strict, complex federal and state alcohol regulations that govern the business. Our business law firm has a keen understanding of the regulatory framework distilleries need to comply with in order to start doing business. Our thoughtful counsel in these areas, such as the three tier laws, will allow Illinois distillery business owners to focus on the important day-to-day business operations instead of the myriad of legal issues. There are many issues to consider when starting a distillery business in Illinois. The first step is to address the business organization. Distilleries also need to be aware of strict, complex federal and state alcohol regulations that govern the business, such as the three tier laws. Organizing and forming a distillery business, like all businesses, also involves the creation of business agreements, both internal and with third parties, such as suppliers, vendors. Our Chicago corporate lawyers have experience drafting and negotiating all different types of business agreements in order to appropriately position our distillery clients for success. Additionally, distillery businesses should highly consider, and our business law firm strongly encourages the protection of the companies intellectual property, specifically trademarks. Our law firm offers guidance through the process of choosing a business name, perform a search and clearance of the state and federal trademark databases to ensure the availability of the business name and/or product names, and prosecute trademarks, as well as deal with other trademark related issues.